Since the issue is going to come up sooner or later, let us cut straight to the chase: I do not think The Merchant of Venice is an anti-Semitic play, although, admittedly, the basic outline of the story is: a story about righteous Christians outwitting an evil murderous Jew could hardly be otherwise. But, just as Mozart and da Ponte took for Cosi Fan Tutte a story that was in its outlines misogynistic and transformed it into something that transcends the crudeness of its source material, so Shakespeare, I think, did something similar here. In the first place, the Christians in his play are far from righteous: they are, Antonio excepted, mercenary – every bit as covetous as they accuse the Jew Shylock of being; they are thieves, or, knowing about and condoning as they do Lorenzo’s and Jessica’s theft, accessories to theft; they are filled with hatred for a fellow human being for no better reason that that he is Jewish, and there is no doubting that Shakespeare knew the human cost of this. Indeed, it is this human cost, most obviously for the tormented, but also, I think, for the tormentors, that seems to me to be at the centre of this drama that presents us with a picture of humans all very badly in need of the Quality of Mercy. PORTIA: Art thou contented, Jew? what dost thou say? PORTIA: Clerk, draw a deed of gift. Shakespeare could quite easily have given Shylock a few lines that lay bare the anguish of his soul: this is Shakespeare, after all: he could write anything he wanted. But he didn’t. What he gave us instead is utterly prosaic. Olivier famously howled off-stage like a stricken animal after his departure, but, magnificent though that was, and chilling even when I see it at home on DVD, there is no indication of it in the text: it’s almost as if Shakespeare had gone out of his way to make Shylock’s departure from the action of the play as low-key as possible. Shylock leaves the action, and the play can carry on without him: he no longer matters. The problem I have found both when reading it, and also in the various productions I have seen, is that the strand of the story involving Shylock is so overwhelming in its power that is overshadows the other strand involving the three caskets, and Bassanio’s wooing and marrying of Portia. This latest Royal Shakespeare Company production, directed by Polly Findlay, neatly sidesteps this problem. The cost, some may say, is too heavy, as Shylock inevitably loses some of his immense tragic grandeur (one really has to go to the Olivier performance to get the full measure of that); but the gains are, I think, considerable: for the first time in my experience, the other strand of the story commands full interest, rather than appearing, as it so often does, as a tiresome adjunct to a magnificent and terrible tragedy. Care is taken also to bring Antonio – superbly played here by Jamie Ballard – to the forefront: he is, after all, the Merchant of Venice (although both Bassanio and Shylock can also be seen as the merchant of the title), and it is he who holds together the two strands of the play, borrowing of Shylock to provide Bassanio with the means of wooing Portia. But all too often in productions, Antonio fades into the background, overshadowed by Shylock in terms of dramatic stature. Not here. The production opens and closes with Antonio alone on stage, and his famous opening line – “In sooth, I know not why I am so sad” – is delivered as if in anguish. And soon, the cause of the anguish becomes apparent: Antonio is losing his young lover, Bassanio, and, while acknowledging that this is only to be expected, he finds this loss hard to bear. Some, I know, will object to this interpretation, but I think the text can support it, insofar as no modification is required to accommodate it; and it does, I think, give Antonio a dramatic presence that, in other interpretations, he all too often lacks. Money taints everything here. Lorenzo, for instance, speaks his line “Beshrew me but I love her heartily” only when transported by delight on seeing what Jessica has stolen for him from her father. In the famous trial scene, Bassanio throws across the floor of the court the money he has brought with him to pay Shylock off, so the entire climactic scene takes place with the characters literally wading through filthy lucre. The set itself – abstract, with a vast polished metallic floor and wall –suggests a world in which money rules absolutely, and covetousness is universal: in this world, Shylock becomes a convenient hate-figure on whose head the others can transfer their own guilt. The one exception to this general covetousness is Antonio, and this makes him a far more sympathetic figure than is usual. He is still hateful in his racism, though: that is not underplayed. In this production, he spits on Shylock’s face – a moment that draws shocked gasps from the audience –and once again, this is consistent with the text: Shylock, in his first confrontation with Antonio, reminds him that he had spat on him, and had kicked him, and Antonio, far from denying any of this, replies that he is likely to do so again. And Shylock bears it all, as he puts it, with a patient shrug, “for sufferance is the badge of all our tribe”. 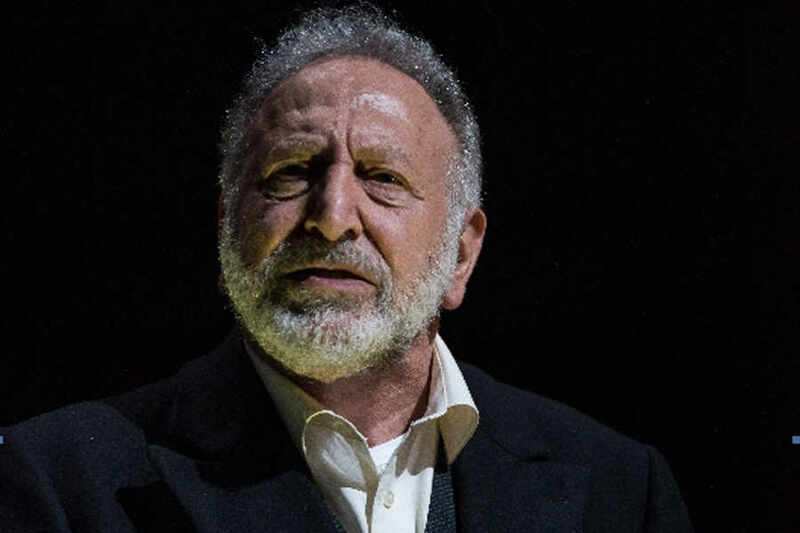 Makram Khoury, the Israeli-Palestinian actor playing Shylock in this production, has an immensely dignified stage presence, and this, somehow, makes the spitting and the abuse that he bears with “a patient shrug” seem all the more horrible. Marvellous though Makram Khoury is, his performance, in keeping with the tenor of the production, is underplayed. Very expertly underplayed, it must be said, but underplayed. His final exit from the court scene is as low-key as Shakespeare had written it: having lost utterly everything, there is nothing further left in him – no grandeur of a tragic downfall, no defiance, not even an expression of hurt. Normally, at the final bow, the actor playing Shylock, despite having appeared in only five scenes, comes on after all the rest of the cast to take his applause, but here Makram Khoury appears with everyone else – a member of an ensemble rather than a star performer – and this seems appropriate for a production that presents this play very much as an ensemble piece rather than as a star vehicle. The court scene is, of course, a huge climactic set-piece, and one could not underplay this even if one wanted to. The strewing of the cash across the floor is a marvellous moment, and particularly striking is Antonio’s sheer terror on facing what he thought was certain and immediate death: his repeated whimpering, which did not stop even after his reprieve, is not something I’m likely to forget in a hurry. And Portia’s “quality of mercy” speech, which can all too easily become a set-piece almost divorced from the rest of the action, is delivered with a particular immediacy and passion by Patsy Ferran: when she reminds us that mercy is an attribute of God himself, it is hard not to wonder whether even these unregenerate characters crowding the stage, Jew or Christian, could perhaps someday be redeemed by divine mercy. But this possibility, visible for but a moment like some distant vision, soon dissipates: the Jew refuses to show mercy, thus taking himself the final step in the stripping of his humanity; and the Christians, having won the day, exult in their most unrighteous triumph. Are not with me esteem’d above thy life. it is well noted. After this, Portia asking Bassanio for the ring is no joke: it is a test – a test that Bassanio (significantly at Antonio’s urging) very conspicuously fails. Shylock would not have exchanged “for a wilderness of monkeys” the ring he had received from his wife when he had been a bachelor: Bassanio, however, at the urging of his former lover, does, and this lays the foundation for the drama in the final act: the business with the rings is no joke here – it is deadly serious. Portia eventually relents, and forgives Bassanio: perhaps she has not forgotten her earlier speech on “mercy”. But the ending is more open-ended here than usual: the marriage promises to be rocky. In the last Shakespeare production I saw, I lamented the cuts that seemed to me the take the very heart out of the play. There were some cuts here too, but only two that I’d take issue with. Shylock’s “I hate him for he is a Christian” is cut simply to “I hate him”. Presumably this was done to prevent the audience siding against Shylock from the start, but it really was unnecessary: we see soon enough why Shylock has good reason to hate the Christians in this play. Hatred but breeds hatred, after all. O tell me where is hatred bred, in the heart or in the head? Also cut is Portia’s line expressing relief that the prince of Morocco had chosen the wrong casket – “Let all of his complexion choose me so”. Presumably, this is cut to prevent the audience from disliking Portia, but this line too, I think, is important: Portia is no Desdemona, after all, and maybe she too is in need of the divine mercy that she later invokes. As for the other cuts, I can but approve: the various clownings of Lancelot Gobbo are among the weakest scenes Shakespeare ever wrote – it’s almost as if he had lost interest in the comedy – and I doubt that even the finest of comic actors could make too much out of them. The distasteful scene where Gobbo “jokes” with Jessica that her conversion from Judaism will raise the price of pork has, however, been rightly retained. No sighs but of my breathing; no tears but of my shedding. What an extraordinary play this is! When one doesn’t quite know where to start, it is perhaps best to start by conceding the fact: if nothing else, such a concession may win the reader’s sympathy, and perhaps even some measure of forbearance in the face of subsequent incoherence and inarticulacy. Dostoyevsky’s novels have made, and continue to make, a huge impact on me, and yet, when I try to explain why, especially to sceptics, I find myself unable to express myself adequately. One should not, I say, try to apply to Dostoyevsky those criteria whereby we judge the novels of Austen or of Tolstoy or of James to be great: Dostoyevsky was a law unto himself. But how can one explain this law that was so unique to this writer? There seems at times to be no correlate for anything within the novel to anything outside it. But neither is it the case that these novels occupy a world entirely of fantasy: quite the contrary – they throb with the messiness and the ambiguities and the ungraspability of life itself. They depict a reality, although the reality they depict is heightened, and the nature of the heightening remains elusive. The characters seem almost constantly to be in varying states of hysteria and of delirium, and are extreme, grotesque – acting, it often seems, as no character in real life ever acts: or perhaps they do, but not so consistently, and not with such unremitting and uninhibited intensity. The fictional world they inhabit seems closed in and claustrophobic, and yet, at the same time, open to the loftiest thoughts and ideas and intuitions on the most elevated of themes. Ideas are expressed concerning the most fundamental aspects of our human lives, and yet each idea seems undermined even as it is expressed: nothing seems able to hold its shape long enough to achieve any kind of solidity, and no argument along rational lines seems ever to develop. The narrative seems crammed with symbols and patterns, but as soon as one tries to identify and to follow through the symbols, or to use the patterns to understand what happens, they almost immediately break down. This is not realism as it is commonly understood, and neither is it a forerunner of the modern “magic realism”: there is nothing in these novels that is physically impossible, or even, perhaps, granted the extreme and febrile nature of all the characters, psychologically implausible; but the logic whereby the characters act, and whereby the action flows, seems to belong to some strange dream world, some vague, elusive borderline between sanity and insanity, where the rules of rationality that most of us normally use to understand the world seem not to apply. This is very much how I find myself feeling about the novels. There must have been some logic that carried me through it all, I think to myself when I look back on them: my mind was definitely working very hard – indeed, at fever pitch – while I was reading. But how then could my mind reconcile itself to the absurdities and the weirdness with which the novel is so crammed? It could be that my mind is such that it can suspend disbelief at Dostoyevskian absurdities: having spoken to Dostoyevsky-sceptics, not all minds, I know, can; but the other possibility is that, at some mysterious level, within some obscure and rarely-visited compartment of the human mind, these are not absurdities at all; and that it is this compartment of the mind that Dostoyevsky addresses, and in which the action of his novels unfold. But how that elusive compartment of the mind can be described when we are no longer inhabiting the dream remains problematic. In The Idiot, Dostoyevsky tried – to his own mind, unsuccessfully – to depict the perfectly good man in an imperfect world – indeed, a mad world. In a letter written to his niece near the time he started work on the novel, he confesses to the difficulties inherent in this idea: the only truly positive, good figure is, after all, Christ. Dostoyevsky then cites two figures in literature whom he thinks “perfectly good” – Don Quixote, and, rather surprisingly perhaps, Mr Pickwick, and goes on to say that they are successful creations because they are comic: they are ludicrous, and are mocked for being so, but, since they are unaware of their own worth, they arouse sympathy. But Dostoyevsky did not want to go down this path: there is no shortage of comedy in The Idiot, but Prince Myshkin, the Idiot of the title, is most certainly not a comic figure. Nonetheless, Dostoyevsky had somehow to account for his otherwise unaccountable goodness, and also to elicit the reader’s sympathy on his behalf: so he made him ill: Myshkin, like his creator, is epileptic. Early in his life, he was literally an “idiot”, his illness having retarded his mental development. During the course of the novel, we see him as a different kind of “idiot” – a man innocent of human wiles and deceptions, and almost embarrassingly open and frank to all, assuming always the best in everyone he sees. Such guilelessness in itself is enough to mark him out as an “idiot”, but even those who describe him as such find themselves forced to concede that despite his “idiocy”, or maybe even because of it, he has startling insights into the very souls of people around him. But how can such a person exist in human society? For, from the very start, this innocent, this ingenue, is thrown headlong into a world teeming with the most turbulent and unruly of passions and desires – all of which call for a judgement that he is neither equipped nor willing to pass. And here, right from the start, we begin to see cracks in perfect goodness: not that Myshkin isn’t perfectly good, but rather, that such goodness cannot even survive, let along emerge triumphant. Artists always depict Christ according to the gospel stories; I would paint him differently: I would show him alone … I would leave him alone with just one child. The child would be playing near him, perhaps telling him something in his childish prattle. Christ would not be listening to him, but presently fall to thinking; his hand would rest unconsciously on the child’s little fair head. He looks towards the distant horizon; a thought as great as the whole world dwells in his look; his face is sad. An abstract love for the whole of humanity precludes love for a specific person, the essence of which lies precisely in its preferring this one person to the rest of humanity. And this, Myshkin seems incapable of: like Jesus in the imagined painting, the hand is tenderly on the head of the person he loves, but the mind is elsewhere: it is looking to the distant horizon, saddened by thought that is as great as the world itself. Myshkin, from almost the start, finds himself at the focal point of two interlocking love triangles, and in both, while the sincerity and openness of his feelings cannot be doubted, he seems curiously lacking in passion. In one, he is in competition with Rogozhin for Nastasya Filippovna; and in the other, he has to choose between Nastasya Filippovna and Aglaya. Inevitably, parallels and contrast develop – between Myshkin and Rogozhin one the one hand, and between Nastasya Filippovna and Aglaya on the other. In the very first scene of the novel, Myshkin and Rogozhin are seated opposite each other on a train. Towards the end they walk on opposite sides of the road to Rogozhin’s house, where Nastasya Filippovna lies murdered. Rogozhin seems in all respects to be Myshkin’s opposite, his “dark brother”, his ghostly double, who exchanges crosses with him in a deeply symbolic gesture, and who, soon afterwards, attempts to murder him. Yet, it is dangerous, in this of all novels, to be so schematic about matters: if Rogozhin is indeed possessed with all those dark passions that are absent in Myshkin, he seems curiously unable to act upon them. At the end of the first of the four parts of the novel, Nastasya Filippovna goes off with Rogozhin, with Myshkin following them, and what exactly happens afterwards Dostoyevsky, intriguingly, does not narrate to us; instead, he allows us to pick up fragments and rumours. But it is strongly indicated that “nothing” happens between Nastasya Filippovna and Rogozhin: if Rogozhin is indeed throbbing with passion, it is passion on which he appears unable to act. It is not for nothing that the vast, old, rambling house of his, so full of menace and foreboding and so explicitly symbolic of Rogozhin’s own character, has a wing housing a sect of religious fanatics, of castrates. There is, indeed, a sense of fanaticism about Rogozhin himself, although the nature of this fanaticism seems, as so much else in this novel, elusive: it does not appear to be religious fanaticism – Rogozhin is at no point depicted as religious – but his brooding and demonic presence bespeaks, as does the house he inhabits, some profound fanatic darkness of the heart. Nastasya Filippovna and Aglaya, though kept apart in this novel until a climactic scene towards the end, also emerge as complementary opposites – recondita armonia di bellezze diverse. Aglaya seems a cold, haughty beauty, reared in the comfort and safety of the Yepanchin household and possibly something of a spoilt youngest daughter. Nastasya Filippovna, on the other hand, is the “fallen woman”, orphaned as a child and “seduced” – as the euphemism has it – by the man who was ostensibly her protector. In our own time, we do not regard the “fallen woman” as particularly sinful, especially when, as in this case, the woman in question had so little power over her own fate; but things were different then: a “fallen woman” was one who could, like Violetta in La Traviata (or her original, Marguerite, in La Dame Aux Camelias), be famed in the demi-monde, but who was not acceptable in “polite society”. It should not surprise us that, living in such an environment, the fallen woman Nastasya Filippovna harbours a tremendous sense of guilt; but at the same time, she harbours a rage for those who have caused her to be fallen, and who have instilled in her this unmerited sense of guilt; and the guiltier she feels, the greater her rage. She wishes to abase herself, and yet hates herself for wishing so; and she hates even more those inhabitants of “polite society” who expect her to do so. In Myshkin, she sees, for the first time, “a man” – a real man who does not even think of judging her; and yet, this judgement is precisely what she desires: even this lack of judgement drives her into insanity. Both women are attracted to Myshkin – Aglaya for his openness and his utter lack of worldly guile, and Nastasya Filippovna for his compassion, and his refusal to judge. But ultimately, the kind of love that is demanded of him he cannot give: as with Christ in the painting imagined by Nastasya, his love is divorced from its object. His very refusal to judge is indicative of his ultimate detachment. Judgement and condemnation, and the oppressive nature both of their presence and of their absence, seem to me to be very much at the centre of this novel. Myshkin introduces early the theme of the “condemned man”, as he speaks with his usual uninhibited frankness of a friend of his who had been condemned to death, but who had ultimately been reprieved. What goes on in the mind of such a man who is expecting at any given moment to die? Dostoyevsky knew this, of course, from his own experience: such a man has a heightened sense of time, a sense that does not however return when the unexpected reprieve restores him to the common light of the everyday. Myshkin himself is also, of course, a condemned man, although in a somewhat different sense: his illness can, and eventually does, recur with such force as to return him to his previous state of literal idiocy. And Dostoyevsky, in one of the most vivid and immediate passages of writing I think I have ever encountered, describes, again from personal experience, the heightened sense of awareness that is experienced immediately before an epileptic fit; and, as with the heightened sense of time experienced by the condemned man, this too is subsequently lost. In this heightened sense of awareness, one senses, if only momentarily, the most perfect harmony and beauty. But then comes the fit, and the vision fades, and all that remains of it is but a vague and ungraspable memory. But this conjunction of beauty and of harmony in that mystic moment before the fit leads us into another major theme of the novel: the redemptive power of beauty – the power of beauty to bring harmony. Yet, as ever in Dostoyevsky, even when an idea is expounded, even if the idea is precious, it is immediately undermined: Myshkin, in the course of this extraordinary scene, clumsily breaks that all too obvious symbol of fragile beauty, a Chinese vase. Earlier in the novel, he had told Aglaya’s sister, Alexandra, simply to paint what she sees, and to find beauty in it; and yet, throughout the novel, beauty is at odds with what is seen, and rarely if ever accompanies harmony. Nastasya Filippovna and Aglaya are both very beautiful in their different ways, but in neither is there anything remotely resembling harmony, or anything capable of achieving salvation: both are deeply troubled souls. And as for the artist finding beauty in what he sees, the work of art that is central to this novel, and which is described in detail, is one that finds the most heart-breaking ugliness in the very figure who, to Christians, is the epitome of moral beauty: Holbein’s painting of the dead Christ. Here is a painting utterly without hope. Myshkin describes it as a painting that may cause humanity to lose its faith. Even the most beautiful of men, a man who is both divine and human, has succumbed here to the ugliness that is death; the body is stark and bare and utterly devoid of any hint of divinity; rigor mortis has set in, and the greenish tint of the dead flesh seems to indicate corruption; and the features on the face are contorted by the agony in which the man had died. Here is the ultimate failure, not only of goodness, but of the divine: beauty is not present even as a consolation. If we are to look for harmony in beauty, all we find here is a hideous emptiness – a negation in the dead Christ of everything that the living Christ had stood for. And of course, this is also an image of Myshkin himself – the positively good man: whatever beauty there may be in his goodness, nature will not spare him, any more than it had spared Christ himself; nor will nature even allow him a beauty that, we are told, could save the world. At every turn, Dostoyevsky seems intent on undermining the very ideas that to him were precious. And yet, the idea of beauty saving the world remains precious, even if only as an idea. In Dostoyevsky’s fictional world, ideas are not discarded simply because they are undermined, or refuted: ideas here are also states of being, of emotions, and they persist even through failure. The idea of the positively good man is one that is doomed to failure, and, indeed, the sense of devastation one feels in the final pages of this novel is unlike anything else I think I have come across. But the idea that has failed so spectacularly nonetheless remains, co-existing even with the forces that have defeated it. And the forces that defeat it, the forces that draw our lives away from beauty and from harmony, are more than merely acknowledged: they are depicted with the utmost force and vigour, and nowhere more so than in Ippolit’s “confession” – his “necessary explanation”, as he calls it, but which seems neither necessary, nor explanatory of anything. If Myshkin’s very presence communicates a sense of essential human nobility and moral beauty, Ippolit’s “necessary explanation” depicts something very different, and is worth examining in some detail. It is in this section of the novel that we encounter a discussion of Holbein’s painting, and of its terrible implications. Significantly, a reproduction of this painting hangs in Rogozhin’s house, that great heart of darkness where we are sure the final act of this immense tragedy will be played out. Ippolit too, like Myshkin, is a condemned man, a teenager dying of consumption, but Dostoyevsky seems to do everything within his power to alienate any sympathy the reader may have for him. The first time we see him, he is supporting the absurd claims of Burdovsky’s “rights”; and once these claims are shown to be baseless, he reacts angrily to Myshkin’s magnanimity: the very fact that Myshkin can be so generous and so noble to the very people who had so ignobly tried to get the better of him, is, to Ippolit, so indicative of Myshkin’s moral superiority as to be insulting. The paradox is irresistible, and occurs throughout the novel is various guises: thus, the buffoonish General Ivolgin feels slighted not because Myshkin judges and condemns him, but because he doesn’t; and, more significantly, perhaps, Nastsya Filippovna feels belittled by the very feature in Myshkin that has attracted her so to him – his refusal to judge. If judgement and condemnation are terrible things, lack of judgement or lack of condemnation can be terrible also, as they belittle the very concept of one’s moral agency. Ippolit senses this immediately: Myshkin’s forbearance is so great an indication of his moral superiority over those whom he refuses to judge, that he can only see such forbearance as a mortal insult. Later in the novel, he reads his “necessary explanation”, and here, we seem to find ourselves in the world of Notes From Underground: in that earlier work, the narrator had started by telling us that he was a “sick man”: Ippolit too, as we know, is a very sick man. Like the nameless Underground narrator, Ippolit has no illusions about himself, or of the world he inhabits. As with Melville’s Bartleby, Ippolit’s world is defined by a huge, blank brick wall – Meyer’s wall, which is the view from his bedroom window: it defines a world that is blank, inexpressive, ugly – a world that, far from providing intimations of redemption or of transcendence, tells us in no uncertain terms that such things do not and cannot exist. If beauty is indeed to save the world, what salvation can there be in a world beset with such ugliness? Ippolit hates and despises this man because of his meekness, because he has passively accepted his poverty and his misery. He then goes on to narrate a grotesque scene in which he and Surikov stand over the corpse of Surikov’s baby, who had frozen to death; and Ippolit, with what can only be viewed as a calculated cruelty, tells the bereaved father that the death of his child was entirely his fault. Ippolit is struck by the utter lack of anger on Surikov’s part, and, even for this reason, can feel for him nothing but contempt. Later, Ippolit dreams that Surikov has come into a lot of money, but is frightened by his wealth, and doesn’t know what to do with it. Ippolit suggests that he melt down all the gold and make out of it a coffin for his dead child, and that he exhume his child for the purpose of re-burying him in this golden coffin. And this suggestion Surikov, in Ippolit’s dream, accepts gratefully. As with the parables of Kafka, a passage such as this both demands and resists interpretation. To see the scorpion-like creature merely as a symbol of evil seems far too obvious: perhaps it is a symbol also of disease – not merely Ippolit’s, but also of Myshkin’s: Myshkin’s entrance at this very point is surely not accidental, and the horrible “white fluid” on the tongue of Norma is certainly more suggestive of epilepsy than of consumption. But it perhaps does not matter what it is a symbol of: what matters is the sense of grotesque revulsion the dream evokes. And this creature that evokes such revulsion does not exist in nature: it has appeared specially to Ippolit. To Ippolit, and to Ippolit alone, is given the vision of the essential unredeemable horror of the world, and of life. This sense of horror reappears in another dream he tells us of, this time featuring a tarantula; and it seemed to him – although he could not swear to it – that on his waking from the dream, Rogozhin, Myshkin’s ghostly double, had come into his room, and had sat in the chair under the icon lamp, silently staring at him. As an answer to Myshkin’s optimistic piety, it seems unanswerable. Ippolit, facing imminent death, wishes only for the truth, and the truth is what is so “frankly and openly” written on Meyer’s brick wall. Curiously, Myshkin himself responds to Ippolit’s pessimism. Later in this same chapter, Myshkin thinks back on this part of Ippolit’s “necessary explanation”, and “a long-forgotten memory” stirs within him, and takes on “clarity of form”: he remembers the time in Switzerland, when, unable to speak, cut off from the lives of others – from life itself – by his illness, he had observed the beauty of the world around him, this great God-given feast in which even the buzzing fly partakes, but from which he, and he alone, is excluded. And he remembers now clearly the pain of utter hopelessness that had then seized him. It is hard not to be reminded here of Kafka’s famous line, quoted by Max Brod, that there is “plenty of hope, an infinite amount of hope—but not for us”. By the end of the novel, Myshkin is, once again, becomes, quite literally, an “idiot”; meanwhile Ippolit, seemingly to everyone’s chagrin, is still alive, although still under the sentence of death. One had yearned for a redeeming beauty, but had been denied it; the other had never believed in it in the first place. And both are condemned. It is no surprise that Dostoyevsky had felt that the Great Idea that had inspired the novel had failed: it probably never really had much of a chance to begin with. But the failure, if failure it is, is of the idea, not of the novel. It has from the first a doom-laden sense of tragic foreboding, a sense of a profound darkness poisoning a world that tantalisingly promises redemption, but which does not deliver on the promise. It is a world in which only an “idiot” can be a good man, but, being but a idiot, cannot survive. The closing chapters of this novel, where the two ghostly brothers, Myshkin and Rogozhin, keep watch over the murdered Nastasya Filippovna, have haunted my own dreams ever since I first read this novel nearly forty or so years ago: they retain still the power to haunt my imagination. Indeed, in this, my latest reading, I realised that as I was approaching this ending, I was, at least in some measure, frightened of what I knew I would encounter. Only in the chapters leading to the denouement of Anna Karenina have I encountered in a novel such overwhelming tragic power. I started this post by saying I did not know where to start. Now that I am near the end, I realise that I don’t know where to finish either. This vast, complex work seems to be beyond analysis: it constantly demands to be interpreted, but seems greater than the sum of all possible interpretations. One should, given the content, finish the novel in a mood of the deepest despondency, but for some reason, one doesn’t: I suppose this is because the idea that is projected with such power and immediacy of transcendence, of redemption, does not disappear merely because it has been defeated. The fictional world presented in this novel is unlike any other, and, very possibly, it operates only in some obscure and rarely visited compartment of the human mind: but each re-reading hits me with the force of a whirlwind. There was a time when virtually everything I read, I read for the first time. Those were the years of heady discovery, when I would survey all that I had yet to read, and determine that I would conquer, if not all, at least as much as I possibly could. It could be said, with some justice, that I was not so much a reader as a train-spotter, delighting myself by ticking off newly spotted trains on my list. I was, of course, young then, but even in my youth, I soon became drawn to re-reading certain books – partly because I wanted to enter again those fictional worlds that had so enchanted me, and more importantly because I realised that so much of what I had already read I had not adequately taken in. Sometimes, this realisation would strike me even as I was reading the work: I could quite often sense, though not quite grasp, powerful undercurrents in what I was reading, and I’d know that I needed time for the work to sink into my consciousness; I’d know I needed to revisit. And now, with more years of reading behind me than I could possibly look forward to ahead, I find myself at a stage when the majority of what I read I have read before. I have always known, of course, that in my pursuit of literary excellence, I would never, as Alexander had done, run out of new worlds to conquer; but that realisation no longer spurs me, as it once had done, to conquer as many worlds as I possibly could: I find myself less enchanted now with the idea of conquest. What I want now is to understand as much as I can. So now, Don Quixote. It is my fourth reading, but in some ways, it is my first: this fourth reading is my first with the mindset I now have. All books need the reader’s response to complete them, and, inevitably, my response now will be different from what it had been before. And the translation I am reading is different also: it is John Rutherford’s version, published by Penguin Classics, and is one of a triumvirate of recent translations (the other two being by Edith Grossman and by Tom Lathrop) that have all garnered praise both for their accuracy, and for their liveliness and wit. The first time I read Don Quixote, I was fourteen. I read the older Penguin Classics version, translated by J. M. Cohen. I found out later that this version had a reputation for being very scholarly and accurate, but a bit dull and lifeless. Certainly, “dull and lifeless” would have been at the time my own appraisal of the book, but whether this was due to the translation, or my being, as I suspect, too young to take in such a book, I don’t think I am in a position to say. My second reading came in my late 20s, when, having read a glowing recommendation of it in The Observer by the late Anthony Burgess, I excitedly purchased a re-issue of a translation made in the eighteenth century by Tobias Smollett (who, of course, was a fine novelist in his own right). Smollett’s version was everything Cohen’s wasn’t: it was colourful, lively, and very, very funny. Perhaps inevitably, Smollett had cast it in the mould of his own times: in his hands, it became an eighteenth century picaresque novel, of the kind Smollett himself used to write. It was raucous and energetic, but, many opined, it lacked the qualities of inwardness and of nobility, and the melancholy of unfulfilled and unfulfillable aspiration that had led Dostoyevsky to describe this as the “saddest of all novels”. Further, standards of translation were looser then than they are now: Smollett’s version was not always, so I’m told, the most accurate. But so taken was I with the qualities this version possessed, I was not so concerned with those that it didn’t. So when I tackled the book again in my early 40s, it was Smollett’s version again that I went for. But now, with the new translations so widely acclaimed and so easily available, there seems no reason to put off a fourth reading. It has been about fourteen years since I last read this book: I seem to encounter it every fourteen or so years, so now is as good a time as any. Especially as so much of my reading these days is of literature written in the times of Shakespeare. So, how should I approach this book now? It is not possible to discard all the baggage that comes with a work such as this: it is not possible, however much one tries, to put out of one’s mind what one has already heard and read. That Don Quixote is at the same time insane, in that he mistakes windmills for giants and sheep for armies, and also sane, for he can perceive in life a rare beauty that others cannot; that Sancho Panza is the ideal complement to Don Quixote because he is down-to-earth and can see the windmills and the sheep for what they are; that the novel is thus both sad and funny at one and the same time; and so on and so forth – all truisms that anyone could spout about the book without even having read a single page. Is it possible, I wonder, to put this out of my mind when reading, so I can approach it fresh? No, I don’t think it is. Inevitably, my view of Don Quixote – or of The Iliad, or of Hamlet, or of Faust, or of Anna Karenina, or of any of those books that have so exercised our collective consciousness over the centuries – is a view seen through the lens of past readers and commentators. Well, I have started it now. And soon, I shall be posting here, no doubt, comments on it, which, since it is unlikely that I can think of anything to say about this book that has not already been said, are likely to be mere re-creations of comments that had been made before. At least in this way I can out-Borges Borges, for Borges’ Pierre Menard had merely re-written Don Quixote, whereas I, if I go about this correctly, have the opportunity of re-writing its critical commentary. So now, in my armchair at weekends, in bed at night, on commuter trains while commuting, I find myself transported into the world of the great Don Quixote and his loving squire Sancho Panza – for, amongst other things, Don Quixote is also a great love story: rarely have two characters loved each other to the extent that Don Quixote and Sancho Panza love each other. And sometimes, when I am not reading, I find myself listening to recordings of Richard Strauss’ magnificent tone poem Don Quixote. And when I do, I cannot help thinking that, with all due respect to John Rutherford, to Edith Grossman, and to Tom Lathrop, and, indeed, to all others who have attempted this monumental task of translating Cervantes’ novel, it is Rchard Strauss’ translation of Cervantes’ novel into a musical form may well be the greatest translation of them all.